In „Kriegsalbum“ (Waralbum) from Lukas Matthaei, Milena Kipfmüller and Klaus Janek people coming home from wars – soldiers, journalists and doctors – tell their very personal stories about what they lived. They let us have a glimpse in real scenary of military conflicts that in situ are much more confused and brutal than the “cleaned” pictures in everyday news. These experiences doesn´t have exclusivly an impact on their personal lives but as well on our culture. 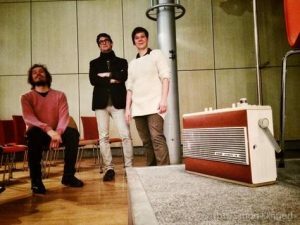 „Kriegsalbum“ gives us an audible picture of these peoples experiances and let them enter into an acoustic dialogue with the everyday sounds of Berlin. 27. November: live-premiere Kriegsalbum – was die neuen Heimkehrer nach Hause bringen in the Akademie der Künste.